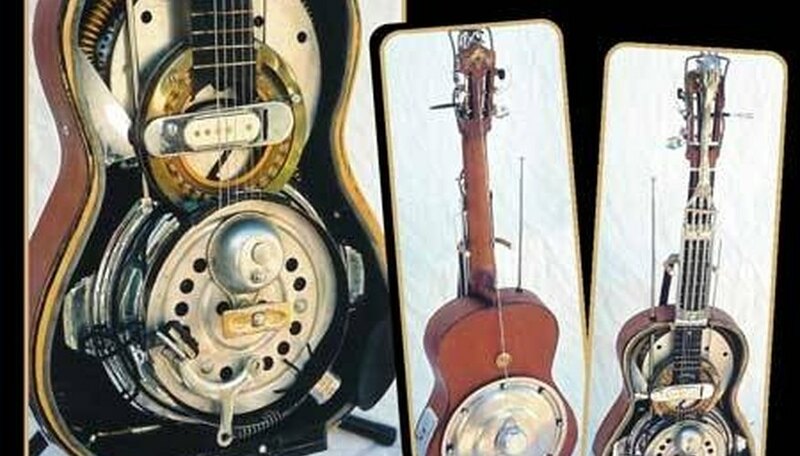 The slide guitarist's art has traveled far and wide since blues players added it to their trick bag during the 1920s. The 1960s blues-rock boom ushered in a renewed interest in slide technique, spearheaded by players like Duane Allman, Michael Bloomfield, and Eric Clapton. However, the slide's ability to create unique voicings has proven itself adaptable in surprising contexts, such as Pink Floyd's quintessentially English dreamscapes. Regardless of which musical genre you choose, playing slide requires greater finesse and concentration, but---once the basics are in place---the rewards are great. Start with the obvious decision---which finger should wear the slide. Only you can decide, because every player's comfort level will differ considerably. Keep in mind that one finger is needed to mute strings, which takes so the index finger right off the list. For most players, the pinkie finger is the method of choice for combining normal and slide playing, because it leaves three fingers free to do the job. Eric Clapton favors this approach, as does Johnny Winter. Realize that all finger choices have their pros and cons. Using the ring finger---the late Duane Allman's choice---still yields a good sound, but makes normal playing harder. Employing the middle finger creates good "power slide" effects, but makes normal playing difficult to impossible. Once you decide, lay the second finger flat behind the slide, to prevent the muting of unwanted guitar strings. Determine which type of slide to use by the type of effect you intend to create. Metal slides work best for a heavier sound, and is great for creating long, slow notes---an ideal situation if you play the electric guitar. For the classic "Texas prairie" atmosphere, a glass slide is generally considered better. On the downside, you give up the sustained attack, and staying in tune proves more difficult. Again, trial and error will determine which type of slide material suits your style. For best results, adopt a slightly higher action, which is the distance between your strings and the guitar. 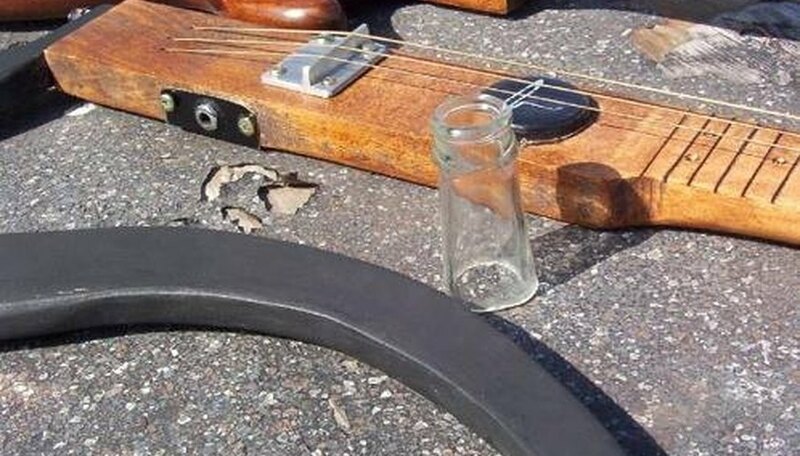 This eliminates string scratching and buzzing that create extraneous noises---unless you use them for effect, as Blind Willie Johnson did on his classic recordings. In general, however, you want to stop the slide from banging against the frets. Press your slide lightly against the strings, moving them up and down the neck as the spirit moves you. This is the biggest strength of slide, and its greatest drawback---since the frets essentially become surplus to requirements, and the only real chord shape is whatever strings you press as the slide goes across them. 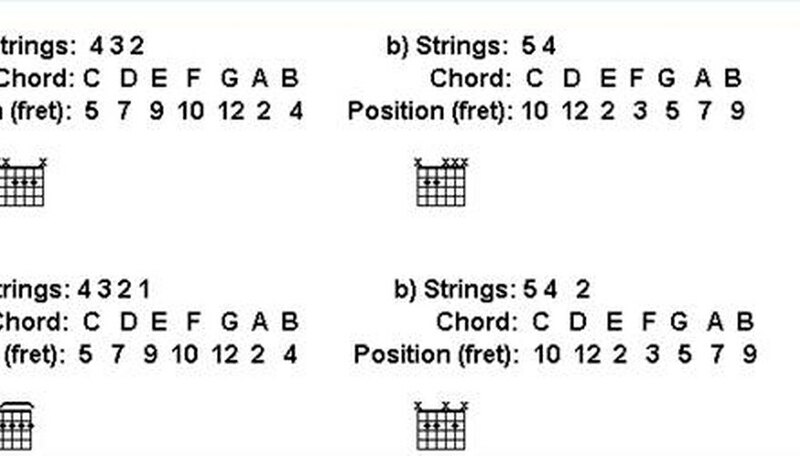 For this reason, serious players want two or three fingers free to create additional chord shapes, if they desire. Move the slide up and down slowly while picking the string, but never clamp down on it. Otherwise, you will have unwanted buzzing. You will soon realize that playing several notes on one string simultaneously is no problem, which is the attraction of slide in the first place. Do not overlook finger vibrato, which is another often-overlooked aspect of slide guitar, but requires less consideration to achieve. Just move your finger slightly along the slide, taking care to do it as you reach the conclusion of a particular phrase---otherwise, your soloing will sound flat. Pay close attention to your picking hand, especially when playing in a country blues style. Most slide players, in fact, use a flat or thumb pick---or, alternatively, their fingers---to give their tones shape, and definition. Speed is not a consideration, because the slide itself is limiting how fast you can play, anyway. Once you have all the basics down, your next concern is what tuning will work best. This is less of an issue for beginners, who will opt to stick with standard tuning of E-AD-G-B-E, which works equally well on electric guitar. Otherwise, if you feel confident, experiment with open tunings. This means that the strings are tuned to sound like a particular chord when they are not already being fretted. Pick up instructional videos or DVDs to learn different tunings. Some of the more common variations include "Vestapol," or Open D (D-A-D-F-sharp-A-D)---which can be combined with a capo---and "Spanish," or Open G (D-G-D-G-B-D). These can also be raised by a whole tone to create Open E and A, as well. Never limit yourself to one or two basic tuning styles. The more styles you learn, the greater the chance that you will feel inspired to create some tunings of your own----since the whole purpose is unlock voicings that would not exist. Also realize that there are always multiple open tunings for a particular key. Experiment with different finger angles to produce different feels. For a more controlled sound, hold the slide right up against your finger, or more loosely, to get a freer one. For best results, use heavier gauge strings of .0013 or higher to get the requisite "syrupy" type of blues sound. Big BIll Broonzy, for example, reportedly used .0017 string gauges. 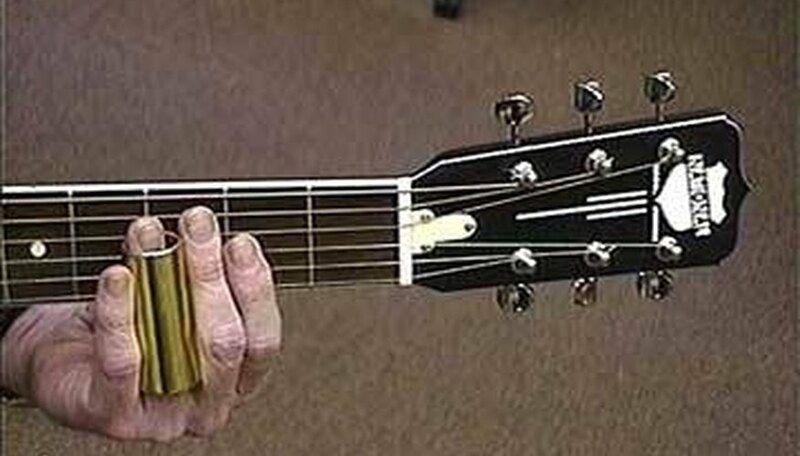 To stay in pitch, keep your slide angled against the fret. Staying in tune while your slide moves around is one of the biggest challenges. 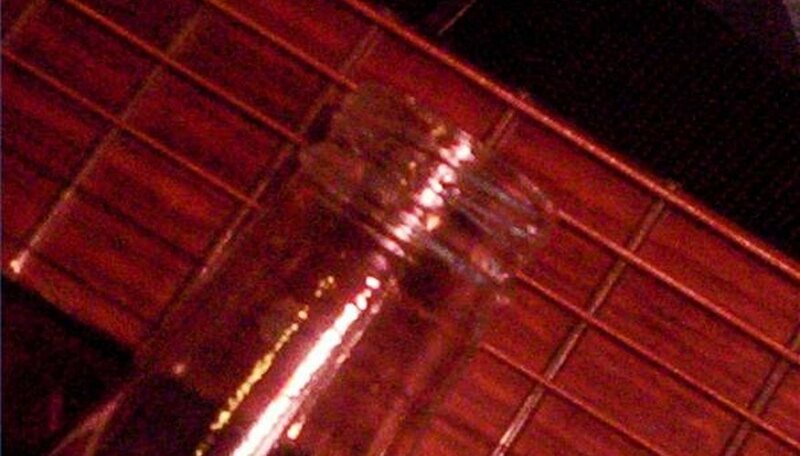 Tune your strings down, if possible, when playing in standard tuning. Tuning the string too far upward can break the neck, especially on an acoustic guitar. Avoid using manufactured glass slides, which tend to lack brightness and sustain. A glass bottle is preferred--the heavier, the better. Don't get hung up on using a manufactured type of slide. Almost anything can be used to get the effect, such as knives, glass and metal tubes, spark plug sockets, and cigarette lighters--as Jimi Hendrix and Pink Floyd's guiding light, Syd Barrett, did to get their respective performances on "All Along The Watchtower" and "See Emily Play."